As their third album the Swedish doom band Kongh has chosen 4 very long songs to be released in February with the title Sole Creation. 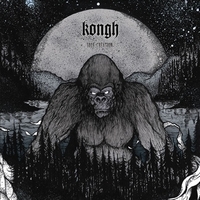 Kongh has become more heavy and doom metal oriented since their last album, but it's a little difficult to get a clear picture of where they stand right now as their album is only 4 songs in total. But with a good inspiration from Ozzy Osbourne on the vocal part the title song Sole Creation opens the album. As the gorilla on the cover picture could indicate the song is full of growls and jungle drums, and the sound has a Scandinavian touch in the build. Next in line is Tamed Brute which could be taken directly from a guitar jam session but the vocals is a painful performance in the style Ozzy Osbourne used in the 80's. The Portals is again a song where the guitars and drums dominate totally, here with a psychedelic twist and the aforementioned Ozzy Osbourne style of singing, and Kongh do it with a class that convinces the listeners of their abilities. Last song is called Skymning (a Swedish word for sunset), but the lyrics are in English, and the guitars are cleaned for all disrupting elements to mess with the clear sound used in this song. And the style on Skymning is pure long drawn and slow, a very doomy kind of metal. Yeah, more music from the jungle. Kongh is here.